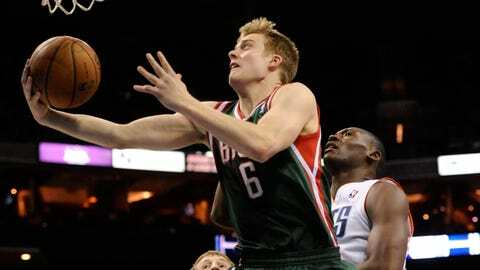 Last season at South Dakota State, Nate Wolters hit 37.8 percent of his shots from beyond the arc. The Bucks rookie is currently 3-of-29 on 3-pointers in his NBA career. He's trying to forge confidence and play more aggressively as a pro. ST. FRANCIS, Wis. — Thrust into an elevated role earlier than anyone expected, Nate Wolters began to get away from the style of play that got him to the NBA in the first place. The rookie guard had become too cautious, passing up opportunities to take a shot or drive the ball to the hoop. But as minutes began to become few and far between, Wolters knew he had to become aggressive to make the most of each opportunity. "Early in the year as a starter I was just trying not to turn the ball over and try to just take care of the ball and play through others," Wolters said after practice Thursday at the Cousins Center. "Now I’m trying to be more aggressive and that will open up passes as well. I’m just trying to put pressure on the defense and try not to play tentative at all. Just be aggressive and have fun with it." Following a solid effort in Wednesday’s loss to Phoenix in which Wolters scored 11 points in 19 minutes off the bench, Bucks coach Larry Drew said he needs to find more minutes and work the second-round pick back into the rotation. The first-year Bucks coach has been impressed with how Wolters has handled the limited role and how he’s taken advantage of the time he’s gotten by playing aggressively. "He gets to that basket and draws contact," Drew said. "A lot of rookies that drive the basketball try to avoid contact. I think Nate is the complete opposite of that. He goes in there seeking the contact and gets his shot off looking for an And-1. "He gives us some energy. He pushes the basketball in transition and if he sees a little hole or gap to get to the basket, he’s not afraid to do that." It’s been a change in mindset for Wolters at the NBA level, but it’s not completely foreign to him. He’s just simply trying to revert back to the type of player South Dakota State fans saw for the past four seasons. "I’m just trying to play like I did in college," Wolters said. "It’s not always going to work out, but I’m just trying to put pressure on the defense and get to the foul line. I think that will help me out a lot." The biggest area Wolters feels he needs to improve in is his jump shot. He’s made 54.9 percent of his shots from less than five feet, but is just 15-of-54 (27.8 percent) from five to 14 feet. Wolters has connected on 50 percent of his shots from 15 to 19 feet, but is 4-of-33 from 20 feet and out. Last season at South Dakota State, Wolters was a 48.5 percent shooter and hit 37.8 percent of his shots from beyond the arc. He’s currently 3-of-29 on 3-pointers in his NBA career. "I don’t think I’m used to the range yet," Wolters said. "It’s a pretty big difference, actually. I’m just trying to get comfortable pulling up on ball screens. Even mid-range, I’ve thought I shot OK with that but I just haven’t shot many. I definitely need to become more confident with my jump shot and expand my range in the coming years." Though Drew agreed Wolters’ shot can improve, he doesn’t feel it’s a necessity in determining if the point guard makes it in the NBA. "I don’t think it will make him or break him," Drew said. "I think he brings a lot of other things to the table that enable him to be out on the floor and be effective. I think him developing his jump shot is just going to be a plus for him and enhance his game even more. But he recognizes that and is always working on that." Even though his minutes per game have slipped from 26.2 per game in November to just 10.5 thus far in January, Wolters recognizes he’s played more than double the time of any other second-round pick. The 22-year-old has even played more than 17 first-round picks from last June’s draft. Injuries to Knight and Ridnour earlier in the season allowed Wolters to play more than he would have if they were healthy, but it also allowed him to show the organization what he can do. "(Coach Drew) has given me the opportunity to play, so that’s been great," Wolters said. "The losing has been tough. It would be nice just to get a couple of wins here, but overall it’s been an OK year. It’s been a learning experience. The coaches have been great, helping me out a ton. It’s great working with them. "There are going to be a lot of ups and downs. Hopefully I’m in the NBA a long time and this is just the first year. I’m just trying to get better every day and keep making progress." Drew is confident Wolters won’t have to worry about a short stay in the league. "I see him having a long career," Drew said. "I think guys like him that have that ability to get to the basket and draw fouls, he’s still learning and there’s some growth there as far as learning the NBA game, but I see him having a solid NBA career." Injury update: Bucks guard O.J. Mayo was away from the team with the flu for the fifth straight day Thursday and will not accompany the team for this weekend’s games in Orlando and Memphis. Mayo, who is averaging 12.2 points per game, first missed the game against Detroit on Jan. 22 with flu-like symptoms but returned to play in both of last weekend’s games. He has since missed Milwaukee’s last two games. "There’s always a concern when you are dealing with sickness, but I’ll leave that up to the medical group," Drew said when asked if Mayo’s illness is serious. "Whenever he’s ready I’m sure he’ll be back." One night after scoring 27 points in the loss to the Suns, forward Ersan Ilyasova did not practice due to a leg injury. Drew said his starting power forward got kicked in the leg Wednesday night and was unable to do a lot Thursday. "We’ll wait and see," Drew said of Ilyasova’s status for Friday’s game against the Magic. Center Zaza Pachulia practiced Thursday for the second time this week and is said to be getting closer to returning to game action. Reserve forward/center Ekpe Udoh will not play this weekend for the Bucks with a sprained left ankle he suffered on Jan. 24 against Cleveland.